As productivities have improved and more niche markets and biosimilars have emerged, the age of mega-sized stainless-steel single-product plants has waned. On the rise are smaller, more targeted plants for niche markets or, increasingly, multiproduct plants. The confluence of increasing titers derived in mammalian cell culture and the use of single-use bioreactors has opened new possibilities for biopharmaceutical companies. These companies can now produce necessary quantities of biologics in smaller facilities in a few campaigns and then switch the entire plant over to manufacturing another product, thereby utilizing the same fixed infrastructure and people across several smaller volume bioproducts. These companies can dispose of nonfixed elements of the infrastructure and replace them with disposable elements that will configure the plant for different product campaigns while avoiding “carryover” or cross-contamination. Upstream bioprocessing has been transitioning rapidly to assimilate single-use equipment such as single-use bioreactors. Downstream bioprocessing, however, has been slower to follow the single-use trend. On the downstream side, few fixed-size machines with disposable flow paths have been offered by existing suppliers. Consequently, bioprocessing companies have been slow to shift entire production facilities, upstream and downstream, to disposable flow path–based lines for traditional biologics. No need for time-consuming cleaning validation studies in process development. Faster changeover from one campaign to the next and thus less downtime between batches. Better product quality due to minimal cleaning or cross-contamination issues. Ability to process multiple products in the same facility. Single-use chromatography systems are starting to take hold among manufacturers of biologics such as monoclonal antibodies (mAbs). As biotechnology evolves, these systems, like other single-use systems adapted for mAb production, need to be modified to help them satisfy the specific requirements of new applications. One of the new applications is gene therapy. As gene therapy emerges as a viable technology in regenerative medicine, the need for viral vectors is becoming clearer. The volume requirement for viral vector production is in many cases an order of magnitude less than that for mAbs. This emerging subindustry requires single-use downstream equipment more suited to its needs. Existing chromatography systems are too large, require a larger support infrastructure, have higher holdup volumes, and are not optimized for small-quantity production. Smaller-scale purification equipment traditionally used for biotech process development could be used to manufacture gene therapy products “at scale.” This type of equipment, however, is not designed to be suitable for cGMP production, and it does not come with disposable flow paths, that is, flow paths that are sterile and have the certifications of material suitability necessary for cGMP manufacturing of biologics. 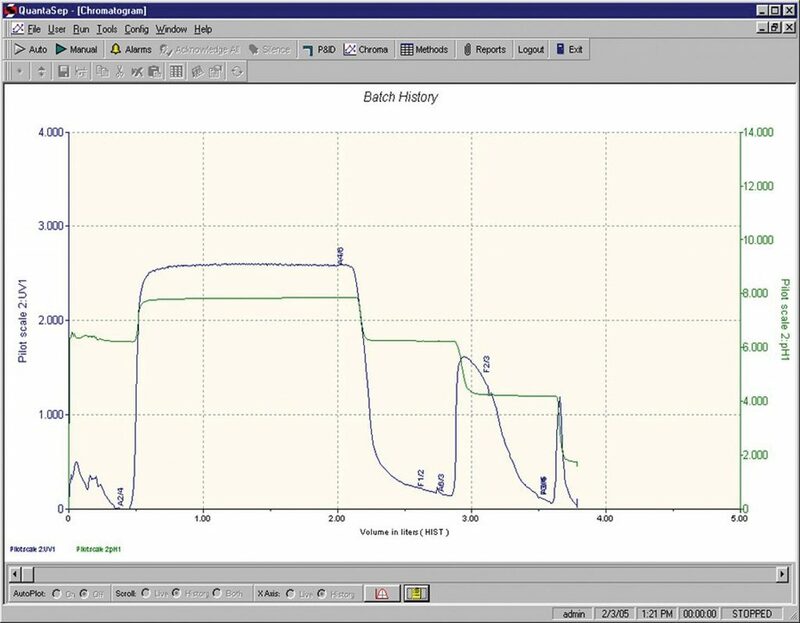 This tutorial describes two Sepragen benchtop single-use flow path chromatography systems: the QuantaSep 300 SU, which has a flow rate of 10–300 mL/min, and the QuantaSep 3000 SU, which has a flow rate of 30–3000 mL/min. These systems are very compact and have low holdup volumes—as low as 10 mL for the smaller system and 100 mL for the larger system. The QuantaSep 300 SU utilizes disposable flow paths of two different sizes. One flow path uses 1.6 mm tubing; the other, 3.2 mm tubing. The 1.6 mm tubing enables a flow rate range of 10–100 mL/min, whereas the 3.2 mm tubing enables a flow rate of 30–300 mL/min. 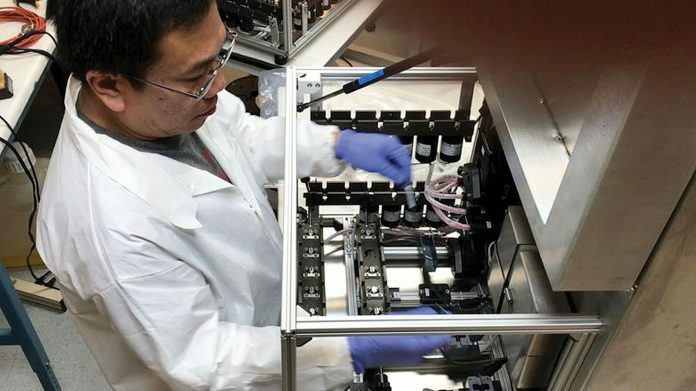 The system comes preinstalled with eight sample and buffer selection pinch valves connected to two pumps, disposable sensors for pressure and air, pre-and post-column pH and conductivity, post-column dual-wavelength UV, and flow meters for each pump. Pre-column auto-air ejection for bubble removal is a standard feature along with gradient capability, column flow directional range from down-flow to up-flow and bypass, along with a built-in ability to collect up to six fractions. The entire flow path comes preassembled and presterilized, and it can be easily installed in under 15 minutes. The holdup volume in the 1.6-mm flow path is less than 10 mL, whereas that for the 3.2-mm flow path is less than 25 mL, enabling the use of column volumes of less than 50 mL for cGMP production. Certificates of compliance relating to wetted materials used and sterility conditions are provided, along with a complete validation file. The software is based on Windows 10 and is 21 CFR Part 11 compliant. The architecture of the QuantaSep 3000 SU system is the same as that for the QuantaSep 300 SU system, but with the larger system, the pumps can deliver up to 3 L/min. The QuantaSep 3000 SU system also has dual peristaltic pumps that incorporate tubing that can accommodate different flow path sizes. The tubing, which is made of reinforced silicone, can have internal diameters of 3.2 mm, 6.4 mm, or 9.6 mm. The larger system is rated for 50 psi, and like the QuantaSep 300 SU, it can be operated in three different flow ranges: 30–300 mL/min, 80–1500 mL/min, and 300 mL/min–3 L/min. Quick-disconnect fittings enable easy connections to disposable bags and the pre-column filter and column. As a result, the operation can be done in a closed path. As shown in Figure 1, simple, easy-to-use, point-and-click software enables the creation of unlimited recipes with or without gradients (linear or step gradients) and fraction changes based on time, volume, bed volume, and sensor values (such as UV, pH, conductivity, air, or UV slope). 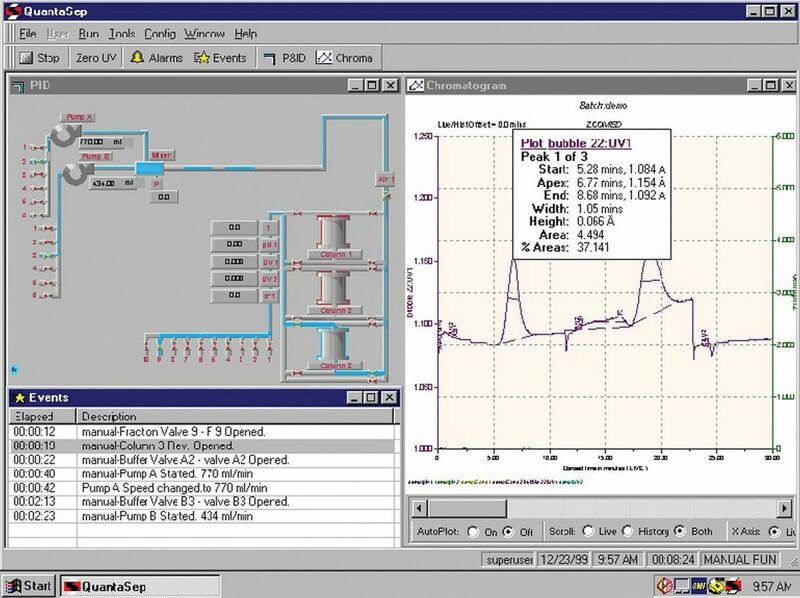 Alarms and event logs; chromatogram functions with pan, zoom and analytic features (such as asymmetry and HETP calculations); and run overlays round out the features that enable convenient use of tools to determine separation performance. Onboard sensor and pump calibration, controlled access, and a secure database ensure compliance with cGMP requirements for chromatography operations. The systems can be used with any columns. Sepragen also provides prepacked columns that can be used for such separations including Sepragen’s prepacked single-use columns, which can be packed with any resin of choice. A run performed with Sepragen’s prepacked single-use columns on the QuantaSep 300 SU system is shown in Figure 2. Finally, the design is simple and enables complete access for easy change of the flow path. Ease of access is depicted in Figure 3, which shows an operator changing out the flow path in real time from a QuantaSep 300 SU system. This tutorial describes the use of novel disposable flow path chromatography systems that can be used for the rapid, inexpensive purification of products for gene therapy (viral vectors). These benchtop systems employ lower flow rate ranges, have smaller holdup volumes and smaller footprints, and are suitable for use with the smaller bioreactors used in gene therapy. Vinit Saxena (vsaxena@sepragen.com) is the founder and CEO, Salah Ahmed is the technical director, and Naveen Kumar Singh, PhD, is the R&D and application scientist at Sepragen.